It's time to bring the Command & Conquer: Mod Spotlight back to a Generals - Zero Hour mod. This mod was highly requested back in 2015 when I first announced I was interested in doing these Mod Spotlights and now it's finally time to dive in BLINDLY! take a good look at what Generals: Contra has to offer. I can already tell from the 5 minutes I looked at this mod to see it it would work, that I've got my work cut out for me. Tonight, May 14th 2017 at 20:00 CET / 18:00 GMT I'll have a good look at what treatment the GLA Faction received. Since Contra introduces 1 new General per faction, I'll go over the vanilla Generals first and save the new one: Assault, for last. For this momentous occasion I've created a countdown here. Hope to see you all then on my channel on Twitch TV! 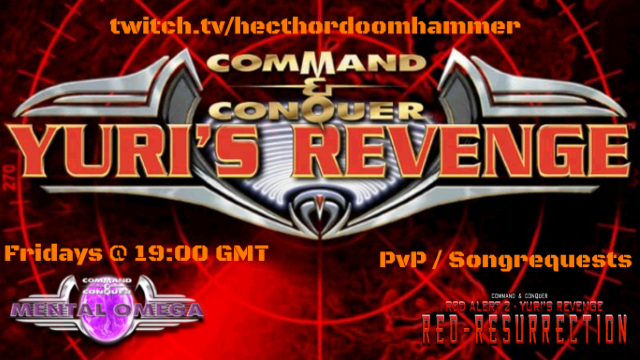 After a short break for a family trip last week, it's time to return to the Command & Conquer: Mod Spotlights. 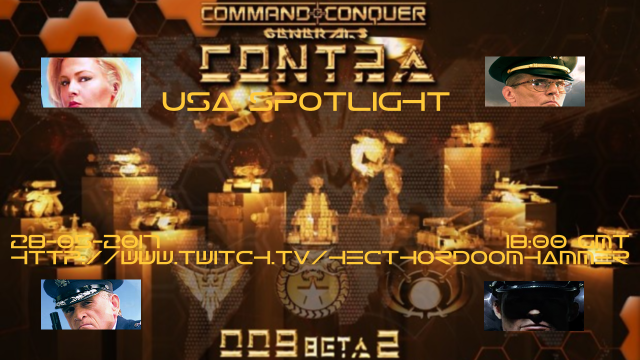 This week's feature will be the entire USA Faction of Generals: Contra. 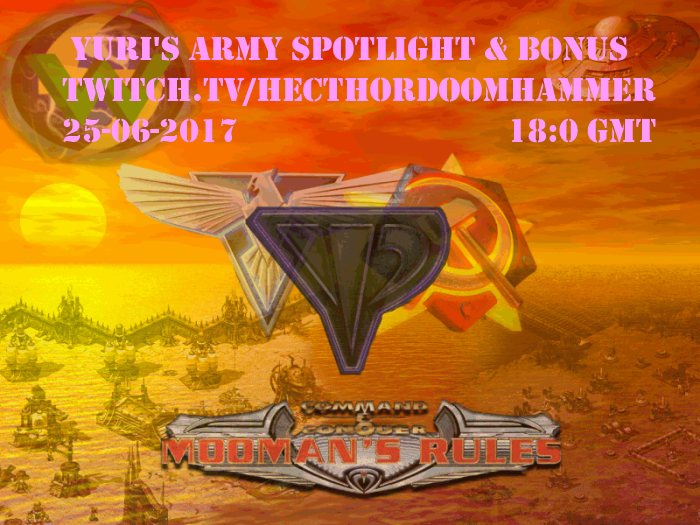 Join me tomorrow, May 28th 2017 at 18:00 GMT / 20:00 CET on my channel on Twitch as I will be showcasing what the developers have done to the existing Generals, as well as look into what this new "Cybernetics" Generals has to offer. (or Robotics). Hope to see you all at the end of this countdown! For as long as I remember, Mooman's Rules was the second mod I ever played. Along with the Tech Expansion and the Tech Wars game mode I spent countless hours playing this mod. 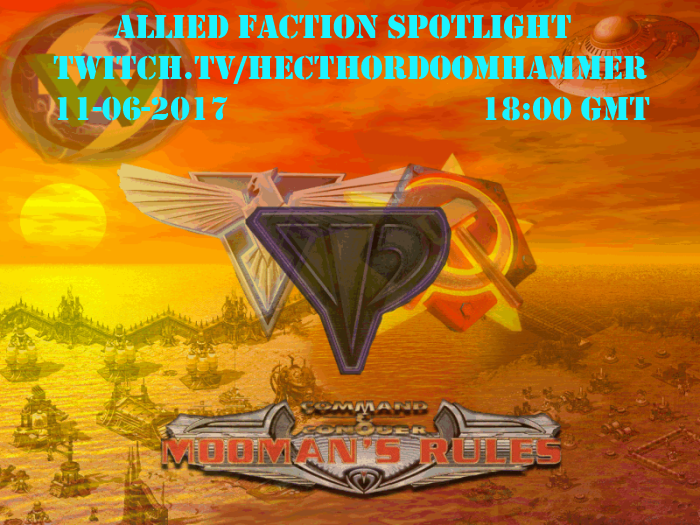 As part of the Command & Conquer: Mod Spotlight series, I'm going to be taking a trip down Memory Lane and showcase what Mooman did with the Allied Faction. I will be starting tonight, June 11th at 18:00 GMT / 20:00 CET on my channel on Twitch. The second stage of the Mooman's Rules Spotlight takes us to the Soviet Side. Join me tonight at 18:00 GMT / 20:00 CET on my channel on Twitch to see what new toys this old mod gave to the Glorious Soviet Union! In Mooman's Rules Yuri only has 1 "country", which would mean that for the last of this Mod's Spotlight it would be a very short stream. But just like with Cannis Rules, I will be showing off some of the extra Game Modes that Mooman's Rules added, which were the main reason I loved Mooman's Rules so much and that allowed me to spend countless hours on this mod. So join me tonight, June 25th 2017 at 18:00 GMT / 20:00 CET on my channel on Twitch so that I can show you what I'm talking about. 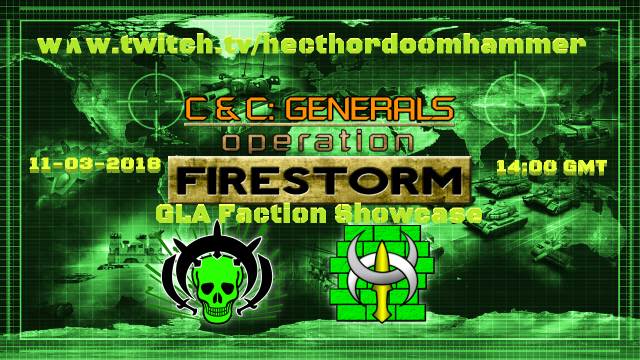 Although my OpenRA Tournament starts tomorrow at 10:00 GMT, I will be holding 1 last stream to try and hype it up! Especially since Twitch has now granted their Affiliates, of which I am one, a SUBSCRIBER BUTTON! 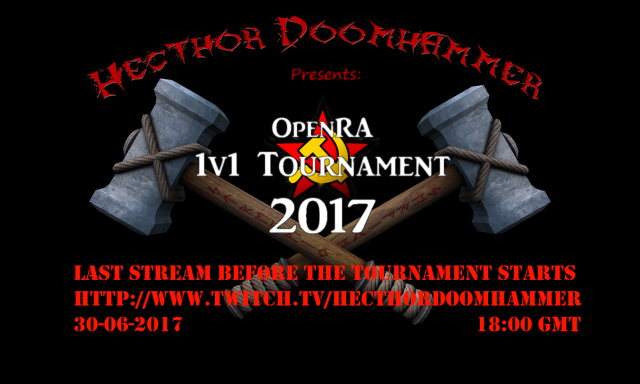 Tonight at 18:00 GMT, I will be streaming OpenRA for a little while to hype up the tournament! Everything is taken care of, except the tournament matches themselves! See you tonight onMy Channel On Twitch! Now that the last of the OpenRA Tournament videos is posted on Youtube and I can put this behind me, it's time to get back to a sort of schedule. I know it has been a few years since I last talked about this mod. and I was planning on including it in the C&C Mod Spotlights, but that was only until its lead developer, Omegabolt told me he was working on an update, since the CNCnet4 was no longer working and it breaking the mod a bit. 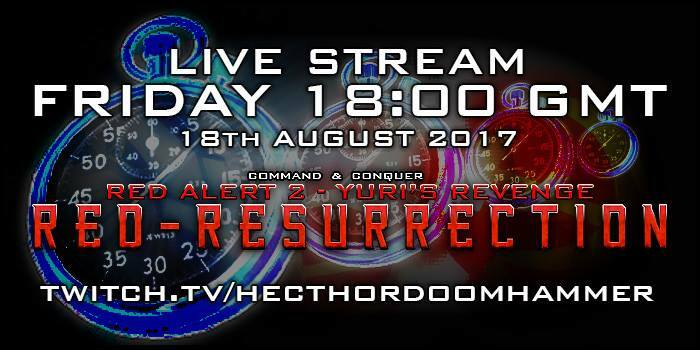 So tonight, August 18 2017 at 18:00 GMT OmegaBolt will join me as I will do an old fashioned Pre-release Beta stream of his mod: YR Red Resurrection! We'll have a trip down memory lane and remember why I loved this mod so much as well as showcase some new units, support powers etc. 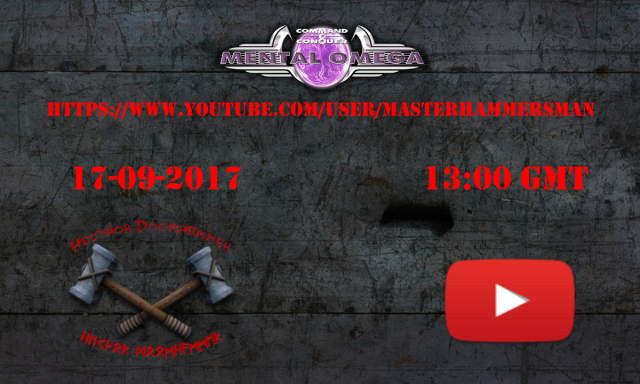 While I will not be home on Friday evening and Saturday evening, I will be holding a livestream of Mental omega 3.3.2 on YOUTUBE! This is to compare the Twitch viewership to the Youtube viewership, plus to see how Youtube streaming has evolved, since now both Streamlabs and Ankhbot allow for Youtube streams. This link leads to the event. Subscribe to my Youtube channel for this and much more content! After about 2 months of hiatus, getting a new job and a new PC, it it some to end my hiatus and come back in all my glory! Tonight at 19:00 GMT / 20:00 CET I will stream Mental Omega 3.3.2 all evening until I collapse and I will be drinking beer from the moment I go live! Join me on my channel on Twitch as I hope to see you all then! 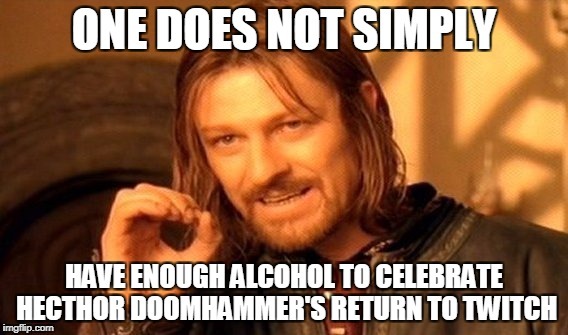 Tonight at 19:00 GMT, I'll bring out the beer and log on SWRnet to see how many people are ready to play. With my life's situation sorted out and my timetable set up, it's time to return to the Command & Conquer: Mod Spotlights. Tomorrow, January 14 2018 at 19:00 GMT I will have a look at what this mod has done to the GLA Faction. After all the reorganizing, rebuilding and celebrating is over, it's time to get back on schedule. Tomorrow, February 11th 2018 at 14:00 GMT I will re-attempt my C&C Mod Spotlight of C&C Untitled, with a GLA showcase. I'm switching the Mod Spotlight streams from the evening to the afternoon, so I can stream longer, as well as not having to worry that I'll oversleep the next day due to the streams being so long. After this I am planning to return to the set schedule of 4 streams per week, so I am back! Hope to see you all then on my channel on Twitch! 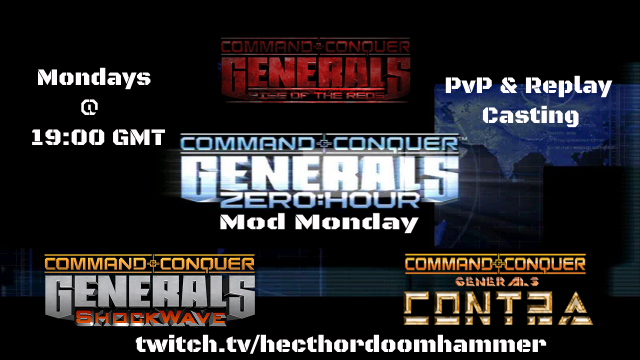 Starting tomorrow, 12-02-2018 at 19:00 I will be dedicating every Monday that I can to streaming 1 of the 3 main Generals - Zero Hour mods on my channel. I will be starting out by checking Rise of the Reds's SWRnet to see how many players there are (always first). If enough, I will stream some PvP this. Otherwise I will check Shockwave's SWRnet to see how many players there are (always second). If enough I will stream some PVP of this. Otherwise I wil check of I have any Replays of either RotR or SHW and cast those (always third). Lastly I will look if I can get a Contra PvP stream going, or cast some Contra Replays. So let's see what we can get done, shall we? So once again, Tomorrow, 12-02-2018 at 19:00 GMT I hope to see a lot of players on Rise of the Reds' SWRnet! As part of my weekly schedule, the Friday is dedicated to the main mods of Red Aelrt 2 / Yuri's Revenge. Another lazy Sunday afternoon, another C&C Mod Spotlight. With GLA done, it's time to have a gander at what this mod did with USA. I keep hearing good things about them, so I am realy curious! Especially since thus far, this mod is aesthetically really pleasing! 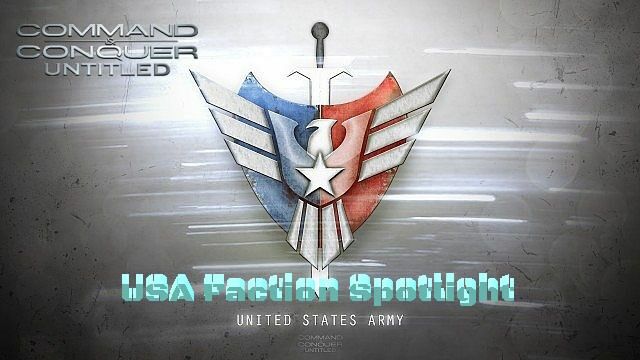 Tomorrow, 18-02-2018 at 14:00 GMT I will go live on my channel on Twitch with the C&C Mod Spotlight: C&C Untitled - USA Faction Showcase. 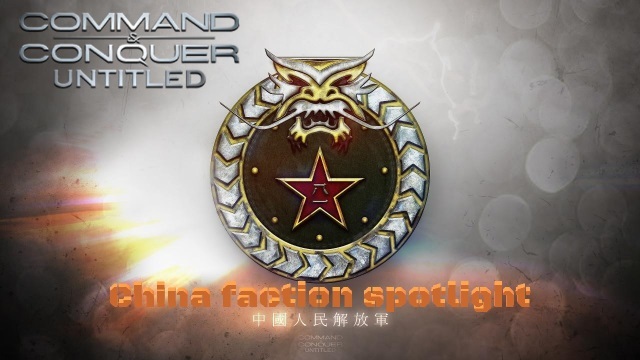 Today, February 25 2018 at 14:00 GMT I will be closing off the series of C&C Mod Spotlights for C&C Untitled with a showcase of the China faction. Not only that, but I will be playing the NEW Patch, 3.76.77 which was released a few days ago. So hopefully you all can join me, on my channel on Twitch and I will see you then! 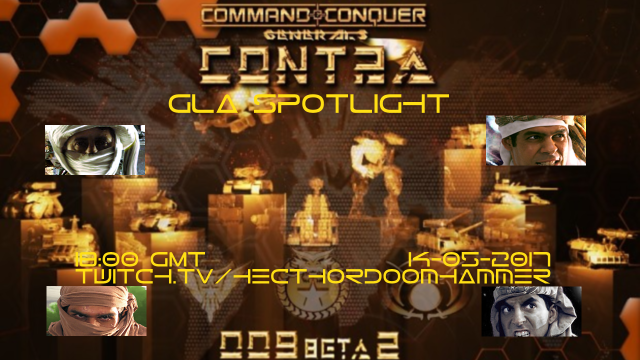 However it also means it's time for another week of streaming, which will start tonight at 19:00 GMT, where I will finish casting the last replays that I still have of Generals: Contra 009 Beta 2 on my channel on Twitch. If there is still time left, I might jump on RotR's SWRnet and see what we can do there. There was a time, back in early 2014, or 2015, when M.Kenosis aproached me, asking if I would be interested in showcasing his mod: EASB Hour for Red Alert 2: Yuri's Revenge. It may have taken some time for me, mostly due to getting my life back on track, but now I am ready. Tomorrow, March 4th 2018, at 14:00 GMT I will be diving into this mod and seeing why M.Kenosis wanted me to showcase his work for this weeks C&C Mod Spotlight. However, due to the fact (yes, I have been spoilered a bit) that this mod only has 3 Countries available in Skirmish, I will only dedicate 1 stream to this mod. But for Youtube, I will be splitting the recording into 3 videos, 1 for each Country. Still, I hope to see you all on my channel on Twitch at the end of this countdown. I've been hearing great things about this mod for years now, and I feel that now is the right time to sink my teeth into it and see why people praise this mod so highly. With the release of OmegaBolt's YR: Red Resurrection 2.2 I would like to dedicate tomorrow's Doomy's Choice Stream to this wonderful mod with some PvP Action.